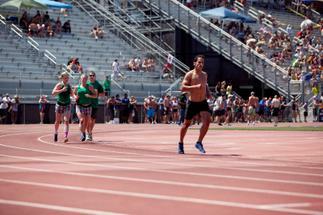 At the Games, CrossFit affiliates have the option of competing as part of a team for the Affiliate Cup. 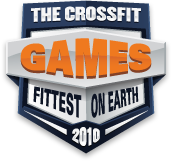 In 2007 and 2008, the Affiliate Cup was awarded based on the combined success of individual competitors from the same CrossFit box. Since 2009, the Affiliate Competition has become a separate set of events that include several team exercises such as the buddy carry and obstacle course. We were curious how the top teams from 2010 prepare for the Affiliate Competition. Over the last few weeks we have heard back from 2nd place finisher CrossFit Omaha and 3rd place finisher CrossFit Albuquerque. Today we cover 4th place Affiliate Team CrossFit Invictus from San Diego, California. In the months after the 2010 Games, CrossFit Invictus team members took time off to travel, recover, and enjoy other sports. Team member Nuno Costa won three medals in the Gay Games in Germany (100m run--GOLD-- 11.34 seconds, 200m run--GOLD--22.99 seconds, 400m--SILVER-- 50.50 seconds), Sage Burgener took home gold for her weight class at the 2010 Nomad Weightlifting Classic in October, and Justin Nahama has been adjusting to training while also taking care of his infant son. The other team members and alternates have been focusing on strength and skill work in the offseason. The Invictus team trains in cycles so to encourage team members to pursue other sports in the offseason. Taking time off to pursue sports is not only fun, but it also keeps a lot of variety in the athletes’ lives. An old teammate may return to the team for 2011. Katie McLaughlin, 2009 Games CF Invictus team member, gave birth to her first child 7 weeks ago but is already looking like she is competition ready. The team is excited to see her progress over the next couple of months. I am so proud of our team and our individual competitors! Getting coached by you studs every day is an honor. 18 January 2011 / 9:19 a.m.
Can't wait to see you guys do your thing again this year, Invictus! See you there! 19 January 2011 / 3:07 p.m.